These stanchions with retractable red stripe belt make great crowd control fixtures for restaurants, event venues and retail stores. 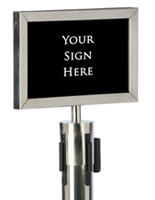 This type of post can create queue lines, separate areas and bar entry to doorways. 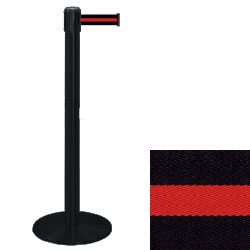 Each of the stanchions with a red stripe belt is made if sturdy metal with a neutral black finish to fit anywhere. 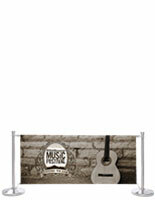 The crowd control poles also have a weighted base for stability in high traffic environments. 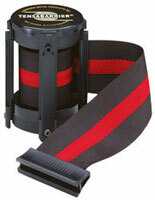 The stanchions' included tape measures 13' long, 2" wide and is black with a brightly colored line in the middle. 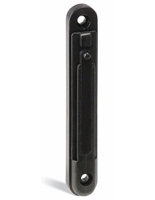 Create complex layouts with the posts' 4-way adapter on top, allowing for winding lines and enclosed spaces.